There is need for self examination to tell oneself the truth. If you are not bearing fruits for God now, then it means something is holding you down. you need to identify what it is, then make an upgrade by way of good disposition and repentance to become the good soil where the seed which is the word of God will grow and produce fruits in plenty. If our commitment in following Christ is not total, we will not be a able to bear fruits for Him. We have been planted by a good God on this earth and we have all it takes to bear fruits for Him if we will focus our mind on it. Distractions of life will definitely come, but they can only take hold of you if you let it. We must purge ourselves of the cares of this life and we will have time for the things of God. For us to bear fruit, we must listen to God's word when we hear it. We must take it to the heart and then make a decision to put it into action. We must resolve to flourish and blossom at all odds wherever we are planted. Good morning dearest one. SmileðŸ˜Šand do have a wonderful day. May your heart be a good soil where the word of God will grow and bear fruits. Amen. *And May the Almighty God bless you: the Father and the Son and the Holy Spirit. Amen. *Watch-Word:* The Lord has sown His words in our hearts! 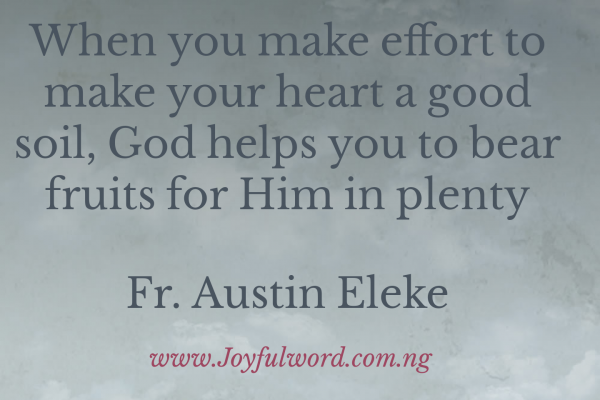 When you make effort to make your heart a good soil, God helps you to bear fruits for Him in plenty.